I am always so thrilled to read the posts here that I have to send a thank you for all that comes from the SCAR project. The project and the women involved all give so much that we are all very very fortunate to be able to hear your words and see your faces. 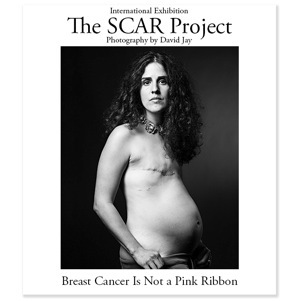 I am going to get to one of the exhibits one of these days but until then I am sharing the excitement along with Sara and all of the courageous women of the SCAR Project. Thank you again. I found your blog by following threads from a posting on Breastcancer.org. about this exhibit. I was aware of the SCAR project and had seen some of the portraits. Thank you for making me more acquainted with this project and some of the women partaking in it. Your posts and postings of their stories have made a difference in my perspective about my own scarred body. It’s been difficult to find any “positive” aspects of having cancer. A glaring one that I could not see before, is that I’ve lived 70 years cancer free. I now realize my good fortune in having had so very many and cannot even fathom what life would’ve been had cancer invaded my young body.